The sticky liquid-filled pitchers of carnivorous plants contain anti-fungal compounds that may prove useful for combating fungal diseases in humans, according to research being carried out at Tel Aviv University in Israel. "To avoid sharing precious food resources with other micro-organisms such as fungi, the carnivorous plant has developed a host of agents that act as natural anti-fungal agents," said Dr. Aviah Zilberstein, an author of the report. "In the natural habitat of the tropics, competition for food is fierce, and the hot, moist environment is perfect for fungi, which would also love to eat the plant's insect meal.” In a study conducted together with Dr. Haviva Eilenberg, Dr.Esther Segal, and Dr. Shmuel Carmeli; Dr. Zilberstein and her colleagues found that unusual secondary metabolites from the pitchers of the carnivorous Nepenthes khasiana plant (originally found in India) were effective against pathogens responsible for widespread fungal infections of people in hospitals. 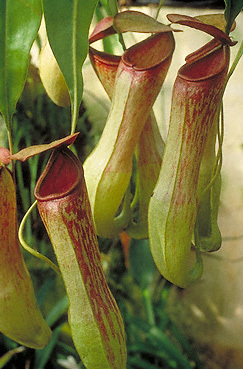 "The pitcher of the carnivorous plant produces these compounds in a gland," said Dr. Zilberstein. Until now, no one has published or discussed the anti-fungal metabolites found in the trap liquid of this plant, she said. Currently there is a need for additional, broadly effective anti-fungal drugs. Even mildly severe forms of athlete's foot or other skin fungal infections lack effective treatments. The problem becomes more severe at hospitals, where thousands of Americans die each year from secondary fungal infections they acquire during their stays as patients. "We're hoping that these metabolites are working together to keep fungus at bay. Our aim now is to get funding for pre-clinical tests of these compounds in an animal model, so we can investigate their effectiveness against the two very acute fungal pathogens found in hospitals worldwide," Dr. Zilberstein said. The idea that liquid from a plant pitcher could stave off infection has been documented in the folk literature of India, where people drink carnivorous plant pitcher juice as a general elixir.